Junior and senior high school students from Ithaca Youth Bureau’s College Discovery Program visited the Department of Human Development to learn about college, research, and concussions from members of Dr. Valerie Reyna's Laboratory for Rational Decision Making (LRDM). 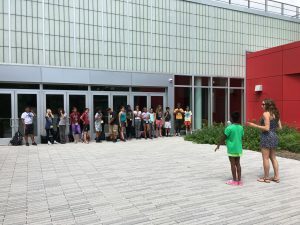 The middle schoolers attended a concussion and the brain workshop on July 17th at the LRDM lab in Martha Van Rensselaer Hall led by David Garavito (JD/PhD) and Joseph DeTello '18. The group participated in a research project on concussions and decision-making and then took part in an interactive program about concussions. Students shook eggs to demonstrate how you don’t need to crack a shell (their skulls) to damage a yoke (their brains). 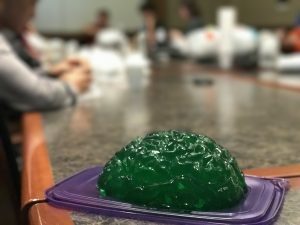 Then they compressed and stretched gelatin brains to see how diffuse damage to neural fibers (axons) in the brain can occur after the impact of a concussion. Allison Franz '18 got the group moving with a game of “blob tag". In this game, a group of students form a “blob” and try to tag other students without letting go of each others’ hands. The tagged students then became part of the blob. As the blob grew and people pulled in different directions, the blob would break apart and lose the tagged players. This is similar to what occurs when there is a blow to the skull and the skull comes to a fast stop - the brain moves in different directions and the neural fibers break resulting in diffuse damage to the neuronal axons. The high school students attended the second brain and concussion workshop in the LRDM lab on August 16th. They participated in the concussion and decision-making project followed by a hands-on demonstration of concussion risks even when wearing helmets. The students loved creating their own "helmets” to protect eggs which were dropped from a great height. They learned that not only did they need to protect the egg from hitting the ground, they also needed to slow the momentum of the egg. This is a very important lesson to learn, as there is often a false sense of security when wearing a helmet in sports like football. Although the skull may be protected by a helmet, an abrupt momentum shift causes the brain to keep moving, resulting in the brain hitting the skull and a concussion. The group also visited the HD EEG and Psychophysiology (HEP) Laboratory. James Jones-Rounds, HEP manager, the lab equipment used for gathering data about electrical activity of the brain, electrical characteristics of the skin, and measurement of eye activity. 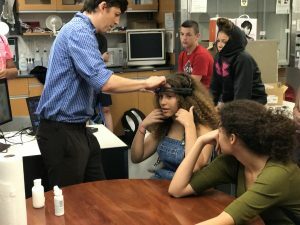 Many of the students volunteered to be in the demonstration - one student even tried on the mobile EEG headset and managed to move a box on a computer screen using her mind! We gratefully acknowledge Engaged Cornell for funding the Engaged Risky Decision Making project which supports our research and outreach with adolescents on the risks of sports-related concussions. Posted in Students in the News and tagged adolescents, Allison Franz, Allison Hermann, College of Human Ecology, concussion, Cornell University, David Garavito, human development, Ithaca Youth Bureau, IYB, Joseph DeTello, laboratory for rational decision making, LRDM, outreach, risky behaviors, risky decisions, undergraduates, valerie reyna, youth on October 3, 2017 by Allison M. Hermann, Ph.D..